Embodiment in Education™ is an intensive somatic movement education training developed by Susan Bauer that offers an innovative new model of holistic education for the 21st century. Workshops and training programs in Embodiment in Education are designed for professionals who work with teens and young adults. The curriculum offered in this training empowers students through development of kinesthetic intelligence, mindful awareness, and ecological consciousness that supports individual and community growth. These basic embodiment practices establish the foundation for further skill development in sports, dance, and leisure activities. By examining their cultural perceptions, students also discover their body prejudices, helping them to both respect diversity and gain compassion for themselves and others. This unique, cross-curricular model integrates science, mindfulness, somatic practices, and social and emotional learning. Now in its tenth year, this professional development training has been attended by participants from across the U.S and six different countries, and has included guest faculty Bonnie Bainbridge Cohen, Deane Juhan, and Caryn McHose. 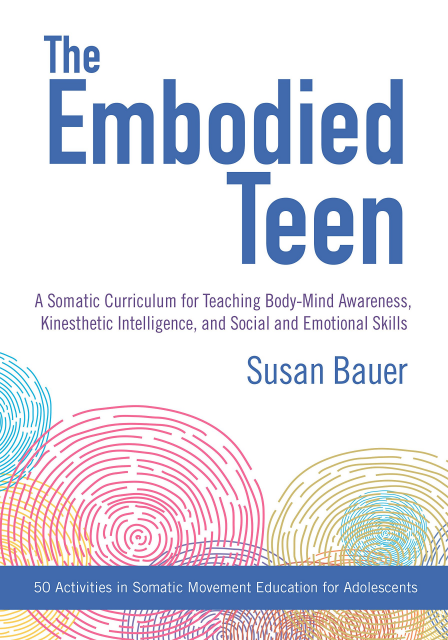 The curricular goals and practices of the curriculum are described in Susan’s new book, The Embodied Teen: A Somatic Curriculum for Teaching Body-Mind Awareness, Kinesthetic Intelligence, and Social and Emotional Skills. “Movement is not something we should outgrow as we move on to “higher” levels of learning; rather, movement and the cultivation of enhanced body awareness should remain central to our education at every stage of life. Who attends these trainings and what is offered? Embodiment in Education trainings are for designed for professionals who work with teens and young adults: middle and high school teachers, movement educators, teen leadership trainers, dance educators, physical educators, yoga teachers, occupational therapists, and all those inspired to usher in a new generation of embodied youth. Training programs to be offered in 2019-2020 include the Embodiment Basics (Level 1), Embodiment Fundamentals (Level 2) [as described in The Embodied Teen]; and a new Teacher Certification Program. There will also be shorter introductory workshops for parents, teachers, movement educators, and others who want to learn more by experiencing these embodiment practices for themselves. Schools and youth programs interested in bringing this training to their faculty, or having classes directly for teen groups, can contact Susan for more information. Together we can move toward a more vibrant, compassionate, and sustainable world. The Embodiment in Education programs also provide a dynamic gathering place for like-minded progressive, holistic educators involved in bridging the fields of somatics, mindfulness, and social and emotional learning.